As you probably guessed, electrical standards abroad are different. The US uses 120v/60Hz. Thailand uses 220v/50Hz. That means if you plug an appliance that is set for 120v/60Hz into an outlet in Thailand, there will probably be lots of sparks and smoke, and possibly some charred flesh. I did this once in Uganda, and the resulting smoke and sparks were entertaining, if not expensive. If it is dual voltage, it will say something like INPUT: 100v-240v, 50-60Hz or AC IN: 100v-240v, 50-60Hz. So if your device is dual- or multi-voltage, you can plug it in directly to a Thai power outlet. That is, if the prongs were the right shape. That’s the next challenge. More and more of the power outlets that I see in Thailand lately allow you to use a US plug. These outlets look like the outlet below. 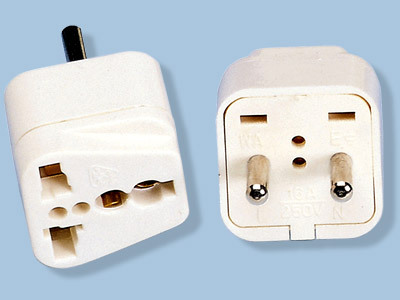 As you can see, this hybrid outlet will accept the US flat prong plug as well as the round prong plugs common in Asia. If you have an outlet that looks like this, you don’t need an adapter. Note that this hybrid outlet is grounded. I found grounded outlets uncommon in Thailand, although they are becoming more common. 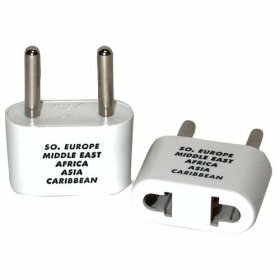 Most are two prong ungrounded outlets, like the ones below. 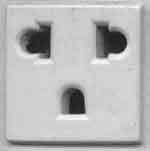 So, if you have a three prong grounded plug and you have an ungrounded hybrid outlet, you will still need an adapter. Of course, lack of grounding can be an issue with some electronics. Be careful! If you want to read more about this in detail, there’s a good article here. Also, if you have sensitive electronics such as a laptop computer, a surge protector isn’t a bad idea. BE CAREFUL TO HAVE THE PROPER SURGE PROTECTOR!!! A surge protector designed for 110v WILL burn out when plugged into a 220v outlet (makes sense, since it protects your electronics against voltage spikes, and 220v is a voltage spike to a surge protector designed for 110v). The easiest thing to do is probably get one when you get to Thailand. Otherwise, they can be expensive. Back to outlets. The other common outlet in Thailand accepts only round prongs, and will not accept flat US prongs. These look like the photo below. They are pretty cheap, especially if you get them in Thailand. They typically run about $0.50 or so. If you want to get them here, you can get them at Amazon.com, and pay a lot more. Make sure you get the ones that are for Continental Europe/Asia. Not all electrical devices are dual- or multi-voltage. Appliances such as hair dryers, electric shavers, irons and similar device are often single voltage, so will only run on 110v. For these, you would need a step-down transformer, which would convert 220v to 110v. These transformers are typically bulky and expensive. They can also be unreliable, and result in fried appliances. If you do want to buy one, they can be purchased at Amazon.com. The other option is to purchase a hair dryer or iron when you get to Thailand. Shavers are kinda expensive there, so maybe stick to disposables. If you really need a hair dryer, I have one that’s dual voltage. Let me know if you want one, and I can bring it with us. If your items don’t have enough battery life to last an 8 hour van ride, or a 13 hour trans-Pacific plane ride, you may want to invest in an external battery. These have become incredibly cheap, and can recharge a number of devices, including smart phones and tablets, usually multiple times, depending on the size and capacity of the battery. They usually charge through a USB port, so if your device charges via USB, this will work. I have a couple of these and they are lifesavers when I don’t have access to an outlet. Here is a good one. One final hint: minimize the number of chargers you bring. Given the ubiquity of universal USB chargers and micro-USB or Apple Lightning connectors, you shouldn’t need a separate charging brick for each device. I like to bring one that has multiple USB ports that I can charge everything on, similar to this. Then all I need is a cable for each device I want to charge. Or even better, I recently purchased this, which is both a wall charger AND a battery.